Usually ships within 3-5 business days and we send you the tracking number. Whitewash... That's right - but done in a manner that almost highlights the beautiful grain pattern of the wood. 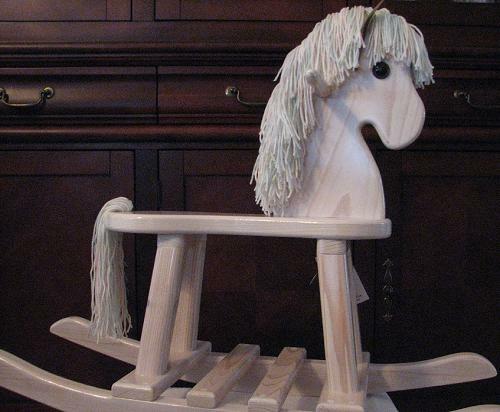 Solid wood rocking horse with a cute pony face and a wild colored mane and tail. These are built one at a time in the Old Rebel Workshop and can become family heirlooms. The dimensions are 30" long X 23" high X 10" wide - very stable for a child as young as 1 to 1-1/2 years and the size still suits up to age 4 or more. This happy horse is solid cypress wood. You can see the button eyes and the pointy ears. Added center cross pieces on the rockers make it easier for a younger child to get a great ride. And the 30" rockers mean an older child will still enjoy it. Each horse is handmade to order.. If you would like a special color mane and tail, let us know and we'll see what we can do.